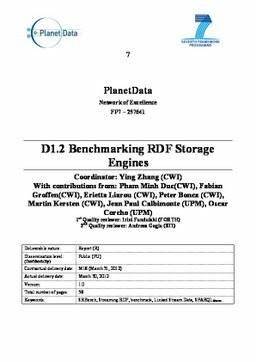 In this deliverable, we present version V1.0 of SRBench, the first benchmark for Streaming RDF engines, designed in the context of Task 1.4 of PlanetData, completely based on real-world datasets. With the increasing problem of too much streaming data but not enough knowledge, researchers have set out for solutions in which Semantic Web technologies are adapted and extended for the publishing, sharing, analysing and understanding of such data. Various approaches are emerging. To help researchers and users to compare streaming RDF engines in a standardised application scenario, we propose SRBench, with which one can assess the abilities of a streaming RDF engine to cope with a broad range of use cases typically encountered in real-world scenarios. We offer a set of queries that cover the major aspects of streaming RDF engines, ranging from simple pattern matching queries to queries with complex reasoning tasks. To give a first baseline and illustrate the state of the art, we show results obtained from implementing SRBench using the SPARQLStream query-processing engine developed by UPM. Zhang, Y, Pham, M.-D, Groffen, F.E, Liarou, E, Boncz, P.A, Kersten, M.L, … Corcho, O. (2012). Benchmarking RDF Storage Engines. PlanetData Deliverables.